Citation Information: J Clin Invest. 2016;126(3):975-991. https://doi.org/10.1172/JCI79196. Chronic myelogenous leukemia (CML) results from transformation of a long-term hematopoietic stem cell (LTHSC) by expression of the BCR-ABL fusion gene. However, BCR-ABL–expressing LTHSCs are heterogeneous in their capacity as leukemic stem cells (LSCs). 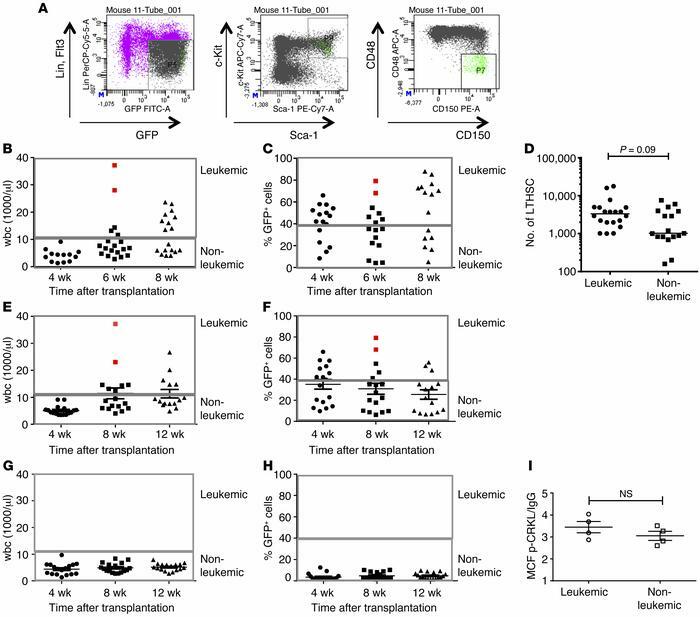 Although discrepancies in proliferative, self-renewal, and differentiation properties of normal LTHSCs are being increasingly recognized, the mechanisms underlying heterogeneity of leukemic LTHSCs are poorly understood. Using a CML mouse model, we identified gene expression differences between leukemic and nonleukemic LTHSCs. Expression of the thrombopoietin (THPO) receptor MPL was elevated in leukemic LTHSC populations. Compared with LTHSCs with low MPL expression, LTHSCs with high MPL expression showed enhanced JAK/STAT signaling and proliferation in response to THPO in vitro and increased leukemogenic capacity in vivo. Although both G0 and S phase subpopulations were increased in LTHSCs with high MPL expression, LSC capacity was restricted to quiescent cells. Inhibition of MPL expression in CML LTHSCs reduced THPO-induced JAK/STAT signaling and leukemogenic potential. These same phenotypes were also present in LTHSCs from patients with CML, and patient LTHSCs with high MPL expression had reduced sensitivity to BCR-ABL tyrosine kinase inhibitor treatment but increased sensitivity to JAK inhibitors. Together, our studies identify MPL expression levels as a key determinant of heterogeneous leukemia-initiating capacity and drug sensitivity of CML LTHSCs and suggest that high MPL–expressing CML stem cells are potential targets for therapy. Heterogeneous leukemia-initiating capacity of BCR-ABL LTHSCs. (A) Representative flow cytometry plots of GFP+ LTHSCs sorted from the BM of control and BCR-ABL–expressing mice. (B and C) 200 GFP+ LTHSCs per mouse were transplanted into recipient mice (n = 20), and wbc count and engraftment of GFP+ donor cells in PB were followed. (D) GFP+ LTHSCs were selected from primary leukemic and nonleukemic recipient mice and transplanted into secondary recipient mice (200 cells per mouse, n = 17). wbc count and GFP+ cells in the PB of secondary recipient mice was monitored every 4 weeks after transplantation. (E and F) Recipients transplanted with GFP+ LTHSCs from leukemic mice. (G and H) Recipients transplanted with GFP+ LTHSCs from nonleukemic mice. Red spots represent the mice that were sick and euthanized or found dead. (I) LTHSCs were selected from BM of nonleukemic and leukemic recipient mice at 8 weeks after transplantation, and p-CRKL expression was analyzed by flow cytometry. Results represent mean ± SEM. Student’s t test was used to assess significance.